Does your recipient love chocolate? If so, look no further. 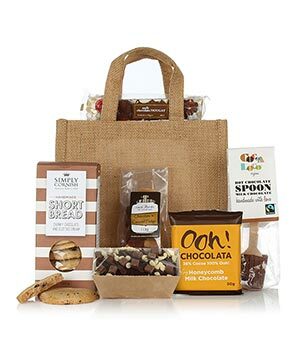 This lovely jute bag is packed full of delicious, chocolate treats that are sure to hit the spot! Delivery Info Next day delivery available for orders received before 12:45 Mon – Fri. Unfortunately we cannot guarantee delivery times. Disclaimer and delivery information Hampers delivered by courier are available for delivery within mainland UK only. The delivery fee is from £6.99 for this item.